So far, Scott Snyder’s run on Batman has been experimental at times and a spit shine to old ideas some other times, but its always been an entertaining run that will end up being remembered right alongside (if not just after) Grant Morrison’s tenure. Giving us a new Batman in Jim Gordon was enough of a fastball, but this month, Snyder teams up with Brian Azzarello and Jock to take us on a slight detour. But is it the detour we deserve? Issue #44 changes pace a great deal, serving as something of a flashback, taking place not long after the events of Zero Year when the city is still in recovery from the Riddler’s siege. 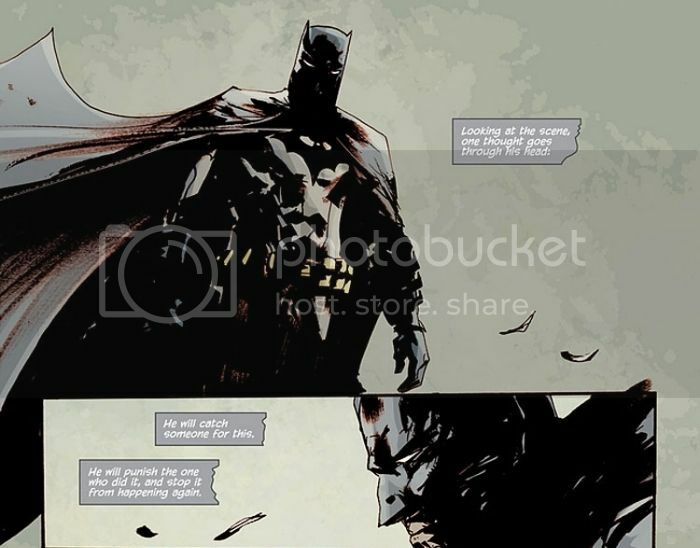 Batman is trying to maintain his brand of order in Gotham while on the trail of a suspect in a mysterious murder. The book reads exactly like I would imagine a superhero team between Snyder and Azzarello. It’s the best of both worlds, combining Snyder’s language and the overall theme of his run (Gotham being an ever evolving organism that Batman either knows too well or doesn’t know as well as he thought) with Azzarello’s hard boiled Elmore Leonard-esque crime drama approach. The aspect that intrigued me the most about this issue is its “man on the ground” viewpoint, really giving you a feel for the citizens struggling to pull themselves together after Zero Year. The people’s economic strife and desperation really calls the inherent arrogance of Batman’s mission into question, asking what one man in a mask can really do when the people he’s protecting have to fight tooth and nail to make a living. And if Gotham’s greatest hero has to wonder about these things, you know this story is leaving just enough meat on the bone for a GCPD backed Dark Knight to chew on. Also, the story leaves enough connective tissue to give us some real insight into Bat-Gordon’s nemesis, Mr. Bloom. On the visual side of things, it’s great to have Jock back on a Batman book. His Gotham (well, the parts that he seems to enjoy exploring in this issue, anyway) is an inner-city wasteland that absolutely hits close to home, resembling the commonly “neglected” parts of several cities across America. Even its name, “The Corner,” implies that this could be almost anyone’s neighborhood in this economic climate. Bottom Line: Though this issue takes a slight break from the main Superheavy storyline, this is NOT Naruto-type filler. Snyder, Azzarello and Jock gives us a completely immersive, visually arresting story that masterfully cleanses the palette for what’s to come.